Go in Burma – the missing travel guide! 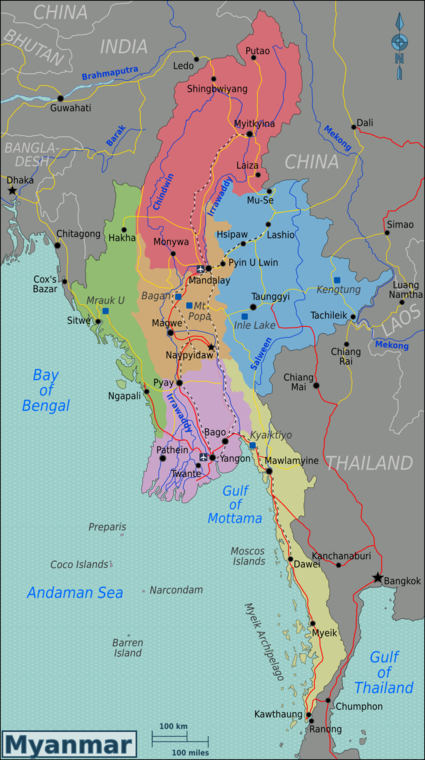 From Burma (Myanmar) with love; a quick guide! This is a Guestbloginasia by Anthony Besson from the blog “mais ou est ce quon va?” Two French getting lost somewhere in Asia. If your life is boring without adventure, these two have one doubly filled enough to entertain you or to give you the desire to do the same. I gave them wild card to talk to us on Myanmar or Burma because Getlost has yet to cover this fascinating country which has quietly started to open up to the world. Travelling in Burma, it is therefore expected to be somewhat of going backwards in time. Arrived at Rangoon, the 70’s looking carpet smelling of cigarette within the very small airport in the capital leaves no doubt to that … especially when you come from Bangkok. The difference is obvious. Taking a taxi is not a problem and you’re on board for an hour’s drive south towards Rangoon. You then let yourself submerge the first images of the country: traditional Burmese outfits (including the famous longji that all men wear), the first gold pagodas, merchants and telephone street … Indeed, the mobile phone is almost absent in Myanmar for one simple reason: SIM cards are restricted to the junta and it sells for U.S. $ 700 per unit. So we had to use phone booths on the sidewalk in Burma! Change money, do not do it on the black market! Burma is a little adventure. Even changing money is a small journey. Even when the ATMs are beginning to sprout , the only way to get kiats (local currency) is to exchange them on the spot against the U.S. dollar. Most guides recommend the black market or street market because the rate is better than the bank: do not listen! Things have changed recently in Burma and you get very good rates at the bank (U.S. $ 1 = 815 khiats in March 2012). Also by changing in the black market, you have 100% chance of being ripped off. We were cheated of $ 400US and we met several travelers who experienced the same. It seems that the business of hocus-pocus in the street is booming with the influx of tourists.Everyone we met was robbed of at least U.S. $ 150. Go to the bank, or change at your hotel. The best rates are in Rangoon or Mandalay, in the big cities. Your dollars are to be in perfect condition! Keep a few bucks anyway: they are used to pay for hotel rooms and to pay for various entrances including to the cities of Bagan and Inle Lake, two major sites. Your dollars are to be in perfect condition (no task, signs of writing, no signs of folds, or horny pieces) and dated less than 10 years. Many times hotels have refused our tickets due to a fold or a very slight ink stain on the edge. However, we always find someone who will take it, especially when we have to pay for passes. Price Inflation: do not trust your guide! We have information from our guide which dated from 2008 that all hotels rates were multiplied by 3. In some cities, including Bagan, prices rose by 50% for some hotels in the last 6 months. The reason is simple, there are few hotels, and tourist numbers increased and the construction of new hotels require licenses provided by the Government. In general, expect between $ 15 and $ 20 for a double room. The breakfast buffet is included in all hotels in Burma. What is there to see in Burma? Like many Asian countries, temples, or rather “pagodas” as they call them there. Almost always in gold, they form structures like pyramids rounded all larger and more majestic as each other. There are really everywhere. Remember that the Burmese are more than 90% Buddhist (Theravada Buddhism). Otherwise, Inle Lake is one of the major destinations, you will discover a city on the lake and the famous way of rowing- the people who row with their feet …! You need to visit this: Bagan with its 4,000 temples is an extraordinary archeological site.. It is recommended that the boat trip on the Ayeyarwaddy River, which flows from Mandalay to Rangoon, takes several days. You sleep on the deck, but you have plenty of time to enjoy the scenery and magnificent sunsets on the river. The legendary friendliness of the Burmese is not a myth! We did observe a single thing from the testimony of travelers who had met in Asia makes a stop in Burma: the Burmese people are a disarming gentleness. This is also what drives many travelers to go for a ride there. And it’s true; we did some fantastic encounters with Burmese who wanted us to discover their country. Their generosity is immense: they invite us to all meals, paid for our taxis and even several times traders have refused the money you pay … But the real gift is that they make us smile full of respect that animates their faces and the time they give us the sole purpose of sharing. So beware, if you go to Bagan or Inle Lake in particular, you will find human relationships “market” as in any tourist site. But if you dig a little into the backcountry, you may get the chance to make real friends Burmese. At the end when the junta? Finally, it is hard to talk about Burma if their policies are not mentioned. The military junta that has ruled since 1962 consists of 400 000 men and is responsible for 40% of the state budget. The benefits of the country’s huge resources of gas or minerals are almost exclusively reserved for the junta. Besides that, every democratic movement since the early days of the junta is severely repressed, causing hundreds or thousands of deaths. The recent abuses have targeted monks in 2007 when they were peacefully demonstrating in support of Aung San Suu Kyi. The junta has also sadly shown his incompetence when in 2008 following Cyclone Nargis which devastated the country; they refused to aid with pride: the cyclone and the absence of international aid have killed 138,000 Burmese! The recent elections of April 1, 2012 opened a glimmer of hope, even if they are only by-elections and Aung San Suu Kyi has managed to win a parliamentary seat. The real political test for the Burmese in 2015 is anticipated that legislative elections will cover the whole parliament. Hopefully Myanmar junta will open to democracy very soon and then share the wealth of the country with the Burmese people. But the political situation should not restrict you going there. Rather, it is going there as you make your idea and you can share your feelings. Burma is a magical country that has much to offer and the Burmese really deserve you meeting their culture. We loved it! So when are you going to Myanmar? Thank you Anthony Besson and his teammate from the blog “Mais où est-ce qu’on va ?” You give us a taste of visiting Burma or Myanmar and also to visit your blog that is packed with info, videos and superb pictures. Tubing in VangVieng in Laos is crazy dude!